Creatures of the night have been returning in a big way to bookshelves in recent years. And though Twilight may currently have the market cornered on teenage vampires and werewolves, that doesn’t mean that they are the only game in town. Thomas Emson‘s first novel for Snowbooks was Maneater, published back in 2008, which focused on the intertwined stories of two werewolf bloodlines extending back thousands of years and a policeman who gets drawn into a murderous plot. In Maneater, Laura Greenacre comes to terms with her wild side as she tries to discover who murdered her family as a child. That honor went to the Templetons, who try to finish the job and resurrect their family to reclaim former glories. John Thorn, a policeman assigned to protect Sir Adam Templeton, finds himself between the families as cascading revenge plots collide. Along the way, Laura and John become romantically entangled as well, but find themselves separated after a battle royale between werewolves in Trafalgar Square. Now, with Prey, Emson reveals the ragged trail of blood, betrayal, and revenge plotted by Ruth Templeton, now lone matriarch of the Templeton legacy. Ruth desires not only the deaths of Greenacre and Thorn, but for them to suffer the deaths of those they love. Once her two adversaries are gone, she can begin to rebuild the Templeton family and claim her rightful place among the rich and powerful. As with most revenge plots, things don’t go quite according to plan. Greenacre and Thorn have allies from all over the globe coming to their aid when they are most needed. And when it comes to protecting their own, the two separated lovers will fight to their last breath. Where Maneater provided more context to the Greenacre/Templeton family feud, Prey focuses on picking up the pieces from the end of the book and following them to their logical conclusion. But don’t worry, the body count, violence, and madness doesn’t let up from where the first book left off. Greenacre, Thorn, and their many enemies manage to consistenly shoot, stab, bash, and sometimes tear people limb from limb. The book was a bit slow to get going for me, but about a quarter of the way through I discovered that I really liked Major Lev Dasaev, the policeman from Russia. Stuck in a marriage he believed in, but his wife did not, he was a decent man who did the best with what he was given. By the end of the book, Dasaev becomes more of a hero for Greenacre than Thorn does, who spends most of the book trying to stay under the radar or simply survive to protect his daughter. The battle in New York City‘s Times Square was amazing as it bounced from character to character finally bringing everything to a head. Greenacre fights the good fight and tries to save as many innocents as she can while the men trying to kill her indiscriminately tear through crowds of people left and right. Ultimately she’s saved by those people she saved in Trafalgar Square years before and those who shared her story on the Internet. Everything came full circle again without feeling rushed or engineered. My only complaint comes with the last two chapters, which were a bit too much like “And they lived happily ever after…” Even though I wanted to be happy for Greenacre, Thorn, and Thorn’s daughter, it seemed rather abrupt to go from Russia to Wales with very little description of how both Greenacre and Ruth manage to suddenly appear. If you read between the lines, the reasoning is there as to how it came to be, but it wasn’t the most satisfying end. Maneater II: Prey picks right up where Maneater leaves off and wraps everything up for Greenacre and Thorn. I’d still like to know more about the history between the Templetons and the Greenacres, but I’m not left wondering what comes next – just about what came before. 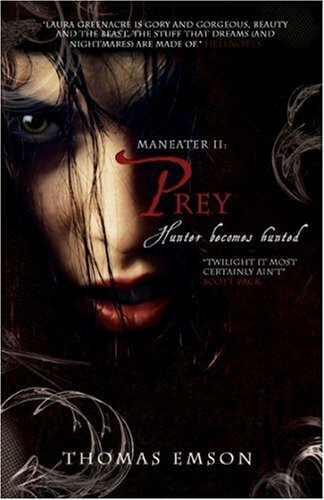 Be sure to check out Prey when it’s released in paperback in February 2010! You can also learn more about Thomas Emson and his books at his website: ThomasEmson.net. p.s. Pick up this and other great books at Amazon! This lookes like a great series. I need some new books to read. Thanks for the suggestion. .-= trench´s last blog ..Surrogates (DVD) =-.